Some of you know that my parents are currently staying with us. This means 2 things; lots of days out, and limited blogging. They arrived last week, which was also half term, so we took advantage of the time for a trip to the Chabot Space Center in Oakland. We had a great time - the planetarium had a child-appropriate film which was great. Would of course have been better if Adam had not been so afraid of the whole 'sitting in a huge room in the dark' experience. They also have a load of hands-on exhibits which we all enjoyed. Adam has been doing the Moon at school and was particularly thrilled to see a piece of moon rock. 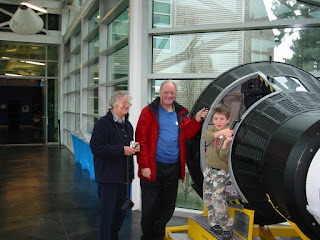 They both enjoyed this replica space capsule, as well as the space suits, we enjoyed the view and the old telescopes. 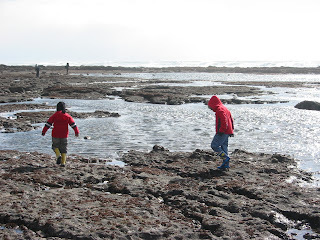 At the weekend we went over to Moss Landing State Beach to inspect the tide pools. Its our favourite rock-pool place and we always get to see lots of activity in the pools, as well as the Harbor seals sunning themselves on the reef of rocks. Combined with fish-and-chips in Princeton it makes for a perfect day out (until someone treads in the seal poo). 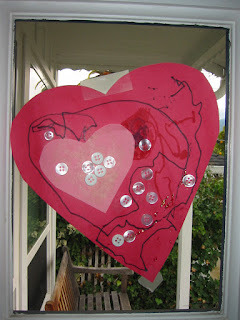 I went to Stitches West on Friday with Mammie and Finlay. (by the way, Finlay had the option to stay home with Grandpa and Adam, but chose to come to 'the knitting'). We (well, I) had a great time - we only went to the Marketplace - but spent several hours shopping for wool. Finlay managed to entertain himself petting wool, admiring the pictures of wild animals (muskox, cashmere goats, camels), and picking up scraps of yarn. Ellens Half pint farm wool and tencel (served by Ellen herself), Blue Moon Bamboo (100% bamboo - with pattern for scarf underneath), Handmaiden Seasilk (silk and something made from seaweed), and some superwash wool sock yarn from Peace Fleece and Blue Moon. I have already cast on the Peace Fleece for socks for my father. We also obtained samples of some sock wool made partly from chitin (derived from crab and shrimp shells). 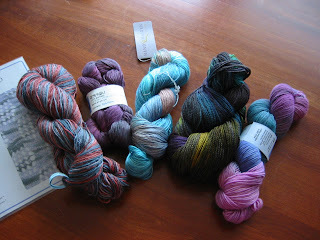 I also bought myself a drop spindle and some roving....but more of that later. I think this was a record for us...we swam on Saturday 17th February. The temperature was about 80 degrees, although the pool was only heated to 65 degrees. It was a little cool for us, but we still all swam for an hour or so before taking refuge in the 100 degree heat of the spa! 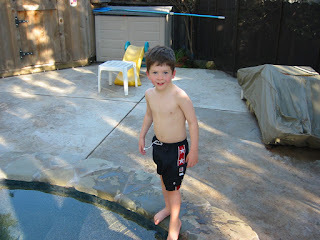 Both boys were pleased to realize that they had not forgotten how to swim over the winter. There was some wool left over from my fetching mitts so I made a mini pair for Adam's friend Emma - she is perpetually clad in pink and orange. (In fact if I thought I could get away with it I would dress exactly like Emma). I adjusted the fetching pattern over 30 stitches, with only 2 cable repeats. 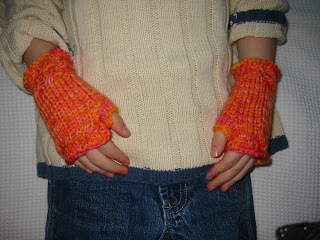 I persuaded Finlay to model the finished mitts, and now he has demanded some for himsef - but not in pink. At least these are a quick knit. 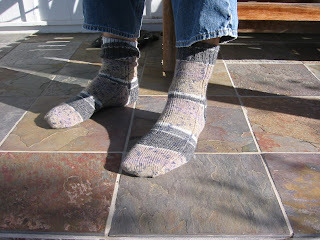 I also finished Nigel's socks. Again my generic pattern, in this case I added a tiny rib down each side which splits at the heel. The cuff is a 2x2 rib. The wool is Austermann Step in colour Cobblestone and it was lovely to knit with; the wool is infused (not sure whether infused is the exact technical term) with aloe vera and jojoba oil which meant that instead of drying my hands out to knit, they were soft and moisturised. I will look out for more of this wool - the patterning is pretty uninspiring, but the texture terrific. 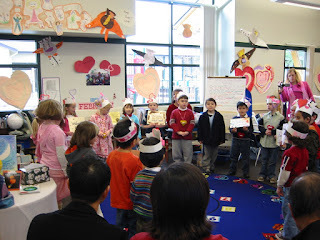 Adam's class had a valentine's day concert today. 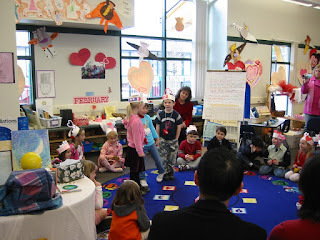 It included some classics as "Turkey Tango" and "Abraham Lincoln". Adam looked terrified throughout - fortunately we had already had a private performance of all the songs, so I knew that he did know the words. After the concert they all exchanged their (home made) valentine's cards, and gave us huge cards that they had made for their familes. 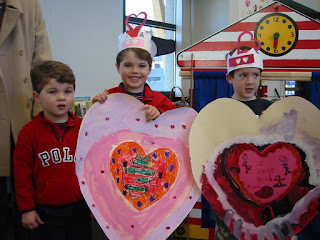 Here is Adam with his friend Matthew, and Matthew's brother Michael. 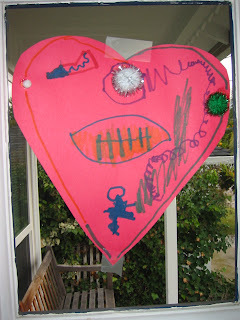 The boys and I made some decorations for Valentine's day. 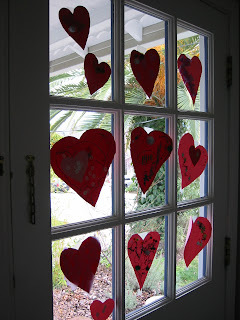 They saw a house decorated with hearts on the way to school and wanted to do the same for our house. I knitted a second pair of fetching mittens for myself. The wool is the knitpicks bare that I dyed with Kool-aid. I wore the mittens in New Orleans and they wore well - the colour did not rub off at all, which I thought might have happened. Certainly Kool-aid seems to create a deeply coloured and fast dye - which completely puts me off ever drinking the stuff! Im back from New Orleans and it's nice to be home. It was very interesting to visit New Orleans again, last time I went was a month before Hurricane Katrina. I was glad that IBM chose to have the conference in NO - but slightly concerned that the city might not be fully 'open for business'. The Convention Center is 100% operational, with no sign that it was ever used as a shelter, except for a monument in a small park adjacent to my hotel, and opposite the convention centre to the people of New Orleans during the hurricane. The French Quarter and Bourbon St seem as lively as ever, particularly as everyone was getting ready for Mardi Gras. However, there are still some signs of the devastation wrought in the area and the recovery is ongoing. My hotel was on the edge of the Warehouse district and there were several boarded up buildings nearby. There were still some boarded up businesses on Canal St and in the French Quarter, and several people reported that restarants that they had previously visited were still closed, or just opening again for the Mardi Gras crowd, or serving just drinks. It was also interesting to watch the local news, where both the news and the commercials were still heavily focused on recovery and rebuilding. In knitting news I got a lot of knitting done during my 6 hours of lectures a day (except when I was actually presenting myself!). I finished these socks, and made a good start on some others. The pattern is my basic sock with a k3p1 rib. The wool is Peace Fleece in colour Waterlily. The wool is lovely and soft, but unfortunately hand-wash only. I will experiment with this as hand-wash socks are not too practical. Im blogging from New Orleans where Im attending a conference. 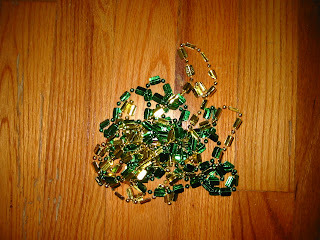 I dont have my camera to show knitting progress...but there is some. I was stuck on the runway at Dallas airport for 3 hours so was delighted to have both my iPod and my knitting in my carry-on bag. (Dont ask me how I can take 5 sharp pointed wooden sticks onto the plane, but not my handcream). 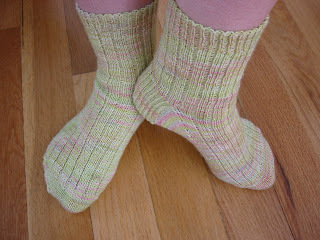 Anyway our delay resulted in a sock from cast-on to turned heel. 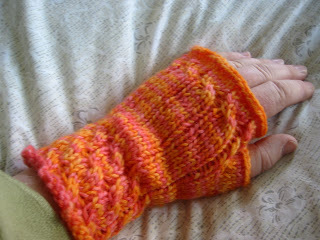 I also finished another pair of fetching mittens before I left using the wool that I dyed with KoolAid. Photo when I return. I have been wearing them here as the evenings are a little cool.